Developed by the US Navy, this pod is fitted with the Mk 11 Mod 5 20 mm cannon, along with 750 rounds of ammunition. This pod is said to have been used on a variety of US Navy and Marine Corps aircraft including the A-4 Skyhawk, F-4 Phantom II, A-7 Corsair II, and OV-10 Bronco. 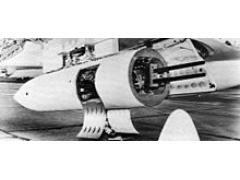 Approximately 1200 Mk 4 Gun Pods were manufactured by Hughes Tool Company, later Hughes Helicopter, in Culver City, California. While the system was tested and certified for use on the A-4, the A-6, the A-7, the F-4, and the OV-10, it only saw extended use on the A-4, the F-4, and the OV-10. In the case of the OV-10, the unit was used by VAL-4, a Navy squadron assigned to Binh Thuy, Vietnam, and was used extensively for close air support missions.